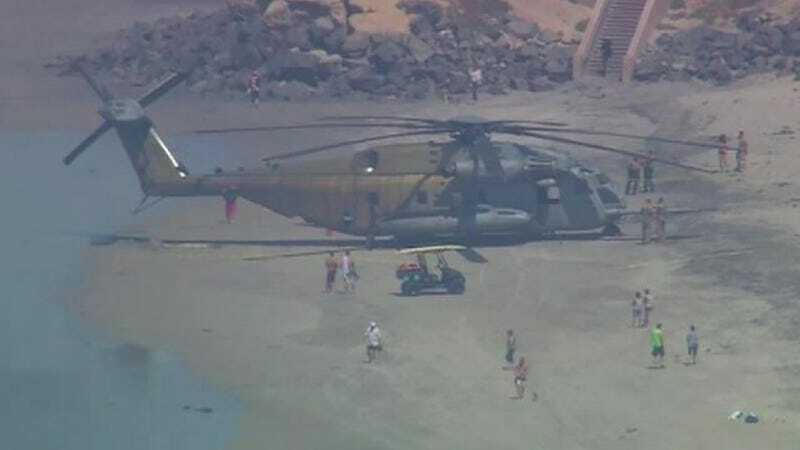 A US Marine CH-53E Super Stallion helicopter just landed on a random beach near San Diego, according to the local NBC affiliate. The 3rd Marine Air Wing operating out of Marine Corps Air Station Miramar said that the massive chopper went in for an emergency landing after a “low oil pressure” warning light went on. There are no reports of injuries, according to MCAS Miramar, but damn, is the CH-53 huge. The Super Stallion is over 88 feet long, 24 feet high, and has a rotor diameter of about 72 feet. It can carry 38 troops inside, with a maximum takeoff weight of 42,000 pounds.